Packaging is the first things that contributes to the user experience (UX), it can set the stage for a great user experience or damage the user's product satisfaction before they've even used your product. Your packaging strategy should fulfil six functions: unique, functional, safe, easy to remove, promote product benefits and reinforce the brand. 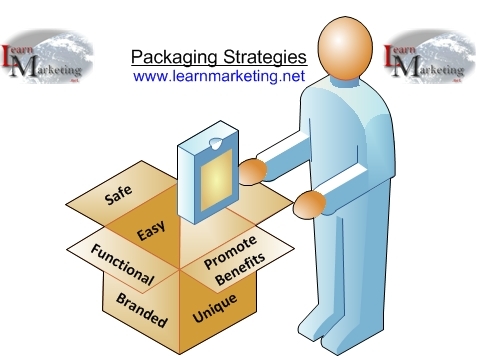 The packaging strategies diagram below captures each of the six functions that your packaging strategy should fulfil. An effective packaging strategy can contribute to the firm's competitive advantage. The diagram below summarises the six functions that product packaging should fulfil. The packaging "must stand out from the crowd" and be different from your competitors. You do not want consumers to confuse your product with that of your competitors. However non branded supermarket goods may do the opposite and produce packaging which is similar to popular brands for example cereals, coke and ketchup. This is to convince customers that they are getting a quality product, which is just as good as the branded version. "Copy Cat" packaging strategies could also be designed to confuse customers into inadvertently purchasing the product, in the hope that they will like it and purchase it in the future. If the packaging has more than one function, ensure that it performs all of its functions. For example the packaging for Muller's corner range of yogurts is divided into two sections; one section contains the yogurt and the other contains the topping. The packaging enables consumers to decide how to mix their yogurt and is therefore interactive. Packaging for food products must preserve the product for a period of time. Whilst packaging for fragile products should protect the product during storage and transit. If the packaging contains product instructions, make sure the instructions are clear and will not be accidentally torn when the consumer is removing the product. The packaging must be tested to make sure consumers can safely use it. The packaging should also safeguard people living with the consumer such as children. For example medicine bottles are designed with caps that children can not remove easily. Do not use dangerous products to wrap your product and make sure the packaging does not contaminate your product. For example in 2011, studies in Germany and Switzerland suggested that the cardboard boxes used to package some cereals could be leaking toxic chemicals into the cereal. The source of the toxins may have been the recycled newspapers used to make the cardboard packaging. Consumer give up products, if packaging makes it difficult to access or use the product. Packaging must also allow consumers to remove it without damaging the product. Some manufacturers will provide labelling on the packaging to help consumers remove it, for example arrows showing which side is the top of the product or instructions on how to remove lids from medicine bottles. Packaging must be designed to promote the benefits of the product. When consumers are deciding on which product brand to choose, they will use the packaging to make their decision. Ensure that the packaging highlights product benefits especially unique benefits not found in competitor products. The packaging of the product must reinforce not just the product brand but also the corporate brand. Will it follow the corporate colour scheme? Will the fonts be similar to other products within your product range? Will the packaging follow the family brand strategy and make the most of brand equity. Although not a separate part of the marketing mix, a good packaging strategy is an essential part of the marketing strategy of a firm. When consumers walk down a shop aisle, the packaging is usually the only thing, that can persuade them to buy your product. The decision to buy is usually a split second impulse decision and your packaging needs to prompt that impulse. A good packaging strategy will endeavour to produce packaging that is unique, functional, safe, easy to remove, promotes product benefits and promotes the brand.